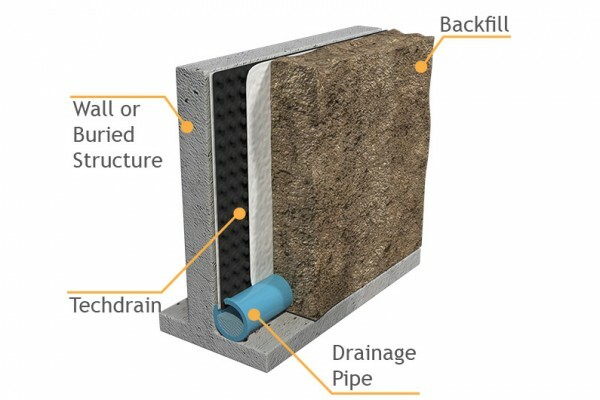 Techdrain geocomposite drainage is comprised of a cuspated HDPE core offering high strengths and high flow rates and a geotextile filter layer on one or both sides. 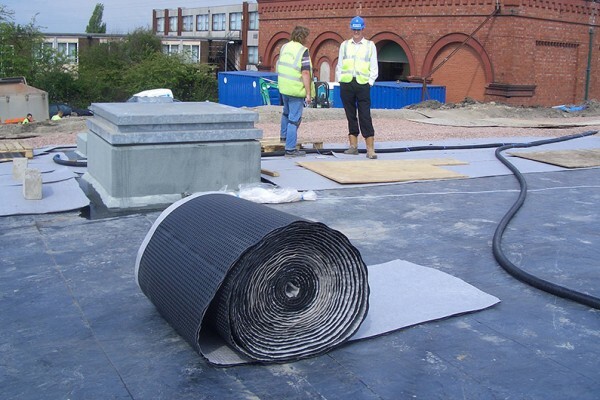 Techdrain can also be manufactured with a full geotextile wrap with core thicknesses available from 6mm up to 40mm. 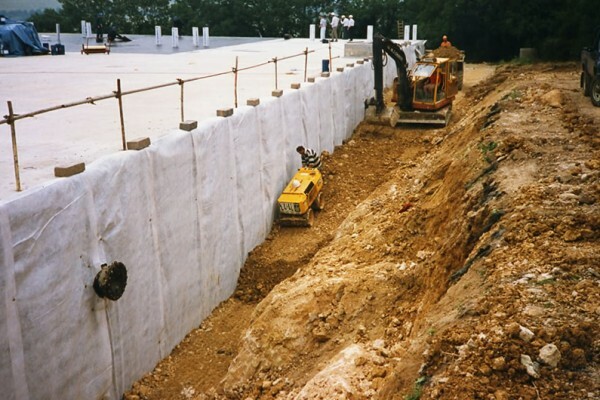 The polypropylene geotextile is bonded to the core and acts as a filter to ensure that backfill fines do not clog the core area and therefore a continuous drainage void is maintained. 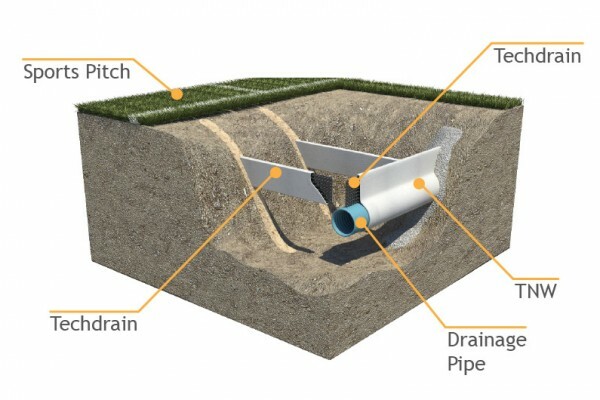 TCS Techdrain can be utilised to provide effective drainage in a wide variety of applications from highway embankments to residential foundations. The planar products are delivered on rolls and are lightweight and easily installed on site. They are easily connected to carrier pipes which are in turn connected to a suitable discharge or treatment point. TCS Techdrain composites range in thickness from 6mm up to 40mm with corresponding variation in flow rates. Compared with the traditional stone drainage layers, Techdrain geocomposites are much thinner whilst maintaining excellent flow capacity. 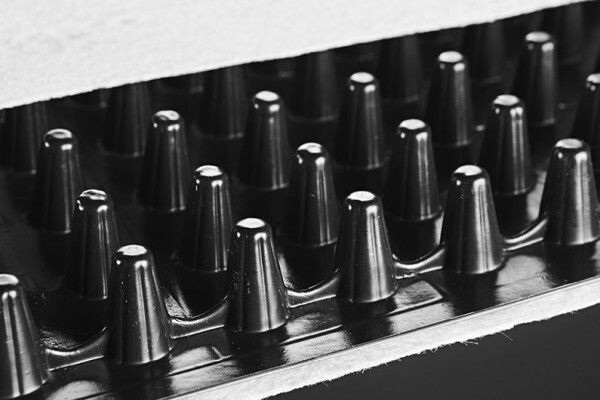 This offers huge cost and environmental savings on importing and placing expensive fill. Reductions in excavation can be achieved against traditional construction methods and easy and quick manual installation offers further savings on plant & labour. 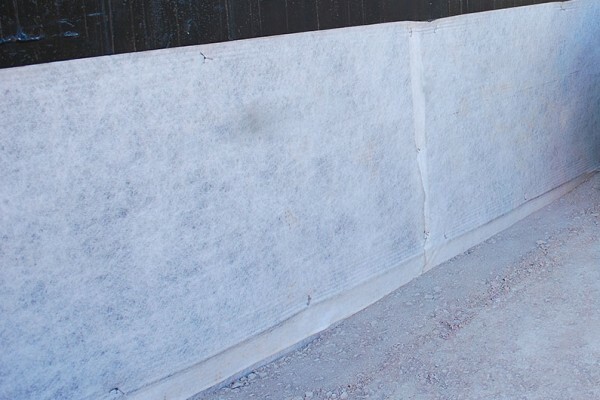 Techdrain can be used either horizontally or vertically in partially or fully buried structure applications such as bridge abutments, basement walls and behind retaining walls, giving high performance flow whilst maintaining its integrity even under extreme loads. 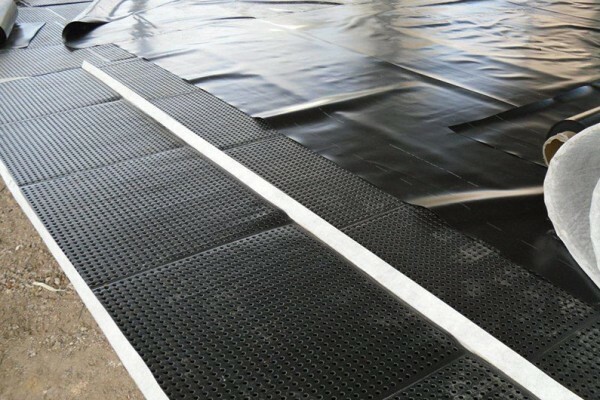 Techdrain geocomposite drainage can be installed horizontally beneath block paving to enhance drainage and prevent the sand layer from becoming too saturated. This is especially important when heavy loads are applied above the block paving and the foundation layer is relatively impermeable (e.g.concrete, roof decks etc.). Incorporating Techdrain within sport fields and golf courses can offer significant savings against the traditional method of perforated pipes and filter stone. Manufactured at 25mm wide Techdrain 25 is available in depths from 100mm to 300mm and can easily be installed in a trench just 10mm wider. This results in less disturbance of the playing surface than encountered with laying pipes and gravel and also reduced material excavation & disposal. Techdrain findrains can be produced for edge of highway drainage. These products are cost effective when compared to traditional granular methods as there is no need to excavate large trenches or import expensive aggregate. Fin drain is available in various depths. Techdrain can be utilised both horizontally and vertically in leachate drainage and gas venting applications in liquid and solid waste containment facilities. Again Techdrain can be installed as interceptor layers or vertical barriers in contaminated land remediation.